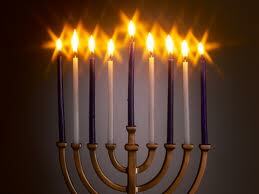 The Menorah: Candles are lit on a menorah, or Chanukiah, in Hebrew. A kosher menorah must have space for eight candles all lined up in a straight row. All eight candles must have the same height. A ninth, extra, space must be raised above the other eight candle branches. So, the fancy candelabra you may have received from your grandmother may look pretty but it may not be suitable for performing the mitzvah of lighting candles of Hanukah. Jews light the Hanukah menorah in memory of the Menorah which was used in the Temple. The Temple’s Menorah was made from one piece of gold. Each of its seven branches, representing the days of the week, were topped by a container that held the oil that fueled the flames. The Menorah was lit on a daily basis by a Kohen, a Jew of priestly descent. The Shamesh: The Shamash, is the lead candle that lights all other candles. If the Hanukah menorah does not have a raised Shamash, it is not considered kosher and should not be used. Even though electric menorahs are widely used, they are not a kosher alternative. Candles vs. Oil & Wick: Most menorahs use candles, but some take oil and wicks. Choose which ever you like best. Oil and wicks are more authentic, but candles give more light and are less trouble than oil. First Night: On the first night of the Hanukah, the first candle is placed to the far right of the menorah. Each candle should reflect how many nights have passed. On each consecutive night, one additional candle is placed to the left of the candle lit on the previous night. How To Light: Use the Shamash to light the candles from left to right, always lighting the new candle first. When you are finished, put the Shamash back in its holder. Blessings: Two blessings are recited each night of Hanukah. On the first night one additional bracha, or blessing is recited. First Blessing: Baruch ata Adonai elohanu melech ha olam asher kiddishanu b’mitzvotav v’tzivanu l’hadlik ner shel Hanukah. Blessed are you, Adonai our G-d, Ruler of the world, who makes us holy through your mitzvoth, and commands us to kindle the Hanukah lights. Second Blessing: Baruch ata Adonai elohanu melech ha olam, she asa nisim l’avoteinu, bayamim ha-hem, bazman ha zeh. Blessed are you Adonai our G-d, Ruler of the world, who worked miracles for our ancestors in days long ago at this season. On the first night of Hanukah, we recite the third blessing, the Sheheheyanu. Baruch ata Adonai, elohanu melech ha olam, sheheheyanu, v’kiyimanu, v’higiyanu, lazman ha zeh. Blessed are you Adonai, Ruler of the world, who has kept us alive and well, and has brought us to this season. Shabbat: Since we light the menorah eight nights, one candle will coincide with Shabbat. Therefore, Friday evening, Erev Shabbat, light and recite the blessings over the Hanukah candles first, and then light Shabbat candles since candle lighting is not permitted once Shabbat has begun. Similarly, when Shabbat ends, make Havdalah, the blessing which signify the official end of Shabbat, before lighting the Hanukah candles. Hillel explained that as we increase the light, we increase the holiness in the world. (Talmud Babli, Shabbat, 21a). Hillel’s opinion prevailed. Pirsumai Nisa: In order to fulfill the mitzvah of lighting the menorah, which means to publicize the miracle of Hanukah, Jewish families place their menorahs in front of a clearly visible window. If possible, it is preferable to put the menorah outside in front of the left side of the door. This is so people who see the menorah and its burning candles will remember and talk about the great miracle of Hanukah. In Israel, many homes are built with cut-outs in the wall next to the front door. These “cubbies” have glass covers to keep out wind and rain. All who pass by and see the flickering lights should remember and talk about the miracle of Hanukah. Remember: Safety First! Keep burning candles out of children’s reach. And, remove any fire hazards before lighting the Menorah! Songs: After the menorah is lit, songs that highlight the miracle of Hanukah are sung. The “Ma’oz Tzur,” Rock of Ages,” tells of the many times G-d saved the Jewish people. Another traditional song is “Ha Nerot Halalu,” “These Lights,” which celebrates the miracles and wonders performed by G-d.
Holy Lights: One is not supposed to use the lights of the menorah for personal benefit. “These lights are holy and we are not permitted to use them, rather all we can do is look at them.” These words, from the song, “Ha Nerot Halalu,” give another meaning to the lights of Hanukah: Meditation and reflection. It is traditional to sit near the menorah and not do any work while the candles are burning. Presents: There is a Jewish tradition of giving Hanukah gelt, real or candy money, to children on Hanukah. The fact that it evolved into eight nights of giving and receiving presents may have more to do with the influence of Christmas in America than with the tradition of Hanukah. Parents not wanting their children to feel bad for not receiving as many presents as their non-Jewish friends, may have begun this custom. The Christmas Dilemma: It is nearly impossible to think about Hanukah in America without feeling overshadowed by Christmas decorations and merchandising, most of which start well before Thanksgiving. It’s hard not to get caught up in the excitement. The songs are on the radio, the stores are brightly decorated, the streets are lit and trees are strung with white lights. Everywhere you look it is Christmas. Even little children know it’s Christmas when their favorite TV characters begin starring in their own Christmas specials. How are you supposed to explain it to your children? Children are the advertisers best audience and they definitely get the message. I’ve found the best approach is total honesty. Explain that most of the people living in America are Christian. And, while people of many religions live here, the majority of people celebrate Christmas. Let them know that they can appreciate and enjoy the commercialism of Christmas, but that we have our own special holidays to celebrate. In Israel, for example, our own Jewish country, Hanukah is the most prominent holiday that is celebrated. Sufganiot: Here’s what you will need: 2 eggs; ½ cup sugar; 1 tbspn vegetable oil; 2 ¾ cup flour; 1 ½ tspns baking powder; ½ tspn salt; 1 cup milk; ¼ tspn vanilla; jam; powdered sugar. Beat the eggs. Add the sugar and the oil and beat again. Combine the flour, baking powder, and salt in separate bowl. Add half the eggs mixture and beat again. Add the milk and vanilla and remaining flour mixture. Refrigerate for 1 hour. Roll the dough to about ¼ inch thickness. Use the bottom of a glass to cut out circles. Place a teaspoon of jam on half the circles. Use remaining circles to cover, and pinch edges together. Deep fry the doughnuts in hot oil at 350 degrees Fahrenheit. When doughnuts are golden, remove and drain. Sprinkle with powdered sugar. Latkes: Here’s what you will need: 5 medium potatoes; 1 onion; ¼ cup flour; 1 egg, beaten; ¼ tspn baking powder; oil, applesauce or sour cream. Grate potatoes and place in bowl. Grate the onion and add to potatoes. Add flour, beaten egg and baking powder. Heat oil in large fry pan. Drop ¼ cup of potato mixture on pan to form a mound. Turn over when brown. Remove and drain. Games: The most popular game associated with Hanukah is the dreidel game. A dreidel is a four-sided top containing a letter on each side. Each letter stands for one word of the phrase, A great miracle happened there (here). The Hebrew letter, nun, stands for nes, or miracle; the gimmel stands for gadol, great; the heh, stands for happened; and the shin, stands for there, or when played in Israel, peh, which stands for here. According to the Kabbalah, or Jewish mysticism, there is a deeper meaning to the dreidel and its four letters. The simple dreidel represents a Jewish historical time line. The four letters stand for four different empires that tried to destroy the Jewish people: Babylonia, Persia, Greece, and Rome. To Play Dreidel: To play, each player starts with ten pennies, or nuts or chocolates. Each player puts a penny in the pot. The dreidel is spun, one player at a time. If the dreidel lands on nun, nothing happens. If the dreidel lands on gimmel, the player wins the pot. If the dreidel lands on heh, the player takes half the pot. If the player lands on shin or peh, the player adds two pennies to the pot. When no pennies are left in the pot, each player adds one. When one player has won everything, the game is over. Special Prayers: The special Al Hanisim prayer is recited during the silent Amidah and in the Grace after Meals, as well as Hallel, the psalm of praise, recited during morning services. Torah readings are taken from Devarim, the book of Numbers, which focus on the story of rededication. On Shabbat morning of Hanukah, a special Haftorah is read from the book of Zechariah 2:14-4:7. This reading was chosen because of its connection to the theme of Hanukah. “Not by might, not by power, but by spirit alone shall all people live in peace.” Some synagogues add readings from the Book of the Maccabees, or even modern plays that highlight Hanukah themes. Zot Hanukah: This is Hanukah, which is also the opening words of the Torah reading.. The last day of Hanukah is thought to have special significance as the culmination of the holiday. Like Shmini Azeret, the eighth day of Sukkot, the eighth day of Hanukah represents an unwillingness to let go of the celebration and spirituality of Hanukah. The Tenth of Tevet: Shortly after Hanukah, the tenth of Tevet is one of four fast days commemorating the destruction of one or both Temples. The Tenth of Tevet marks the beginning of Nebuchadnezar’s seige of Jerusalem, which led to the destruction of the first temple.